Welcome to your one-stop file manager. Start saving your time with the world’s #1 compression software. Zip, protect, manage and share all your files quickly and easily. WinZip® from Corel® is not just a file compression utility, it is a fully fledged file management software that enables quick compression, protection, access, distribution and management of all your files/folders. Now you can instantly unzip any Zip file in Explorer, or from the WinZip Files Pane, the WinZip Ribbon or File menu. Easily unzip files to the folder that it originated from, your Documents folder, or a folder that you choose! With a single click of a button, you can unzip any file to the selected folder in the Files Pane. Now you can strictly focus on the task at hand and not on whether the WinZip application has launched because WinZip now takes half the time to start up. Work faster and eliminate the risk of launching multiple WinZip windows. You can now open and unzip POSIX TAR files in the updated compression format. Quickly and easily unzip a group of Zip files and replace them with their native files. Easily distribute large Zip files without worrying about timeouts or failed uploads/downloads. This convenient feature creates a multi-part zip file for easier distribution. Keep more music on your phone or on a cloud service, or share playlists more easily, with enhanced loss-less MP3 compression. WinZip 22 compresses your MP3 files by 15 – 20% on average with no loss in quality thanks to the enhanced Zipx format. Extract content from the industry’s widest selection of compressed file types, including Zip, Zipx, RAR, 7Zip, BZ2, LHA/LZH, VHD/VDMK, XZ and many more. When extracting encrypted files, WinZip auto-wipes all temporarily extracted copies to prevent misuse. Easily find your most-used files and folders on your PC, network and clouds in Frequent Folders, which updates dynamically. WinZip Express lets you use popular WinZip features even when you’re working in other applications. Use it with Explorer, Microsoft Office, your scanner (Pro only), your photos (Pro only) and Microsoft Outlook to zip, encrypt, share and more. Touch support puts the power of WinZip at your fingertips on any touch-enabled device or computer. WinZip is optimized for 2-in-1 computers, switching its layout automatically depending on whether you are using your system in tablet or notebook mode. Now Enterprise users can enjoy WinZip’s file sharing features using their Slack enterprise solution. Share files and zip files via Slack IM and choose contacts from within Slack’s Contacts; streamlining workflow and eliminating unnecessary steps. If you have work and personal accounts on the same cloud or IM services, now you can add and access all of them in WinZip. You no longer need to log in and out depending on which accounts you want to use. Add up to 16 accounts, give them unique names to distinguish them and enjoy easy access to your files for any of the many services supported by WinZip 22. Now you can handily select recipients by name as well as email address when you email and share directly from WinZip’s internal emailer to any of your contacts with the new Combined Address Book. Add contact information from your email accounts, multiple social media services and local contact directories so you no longer need to go outside WinZip to find the address you need. Sometimes you want to access just one file in a large, multi-file Zip. With WinZip 22, you have the flexibility to move selected files to individual zip files with optional encryption. That means you no longer need to download an entire Zip when using your phone to access files in the cloud, you can simply download the individual zip file that you need. Whether you share files from WinZip or ZipShare, you can now easily keep track of which files you have shared. And, you can use either ZipShare or another cloud service for storing shared files. With the Shared Files dashboard in the Files pane, you can see and manage shared files from WinZip. See a list of shared files (even files you shared on ZipShare), open and view shared files, share files again or remove shared files. Share all or only the selected files you want to send with this handy feature. Once you review or change the contents of your Zip and click Send selected files, you can choose whether to send individually selected files or the entire Zip. Avoid added clutter by sharing files without having to save them first. Previously, when using WinZip’s conversion options, like converting to PDF or adding watermarks, you would need to overwrite the existing file or save the converted file, then find, share and delete it. Now, simply share your converted file by email, IM, social media or the clipboard and the temporary file is deleted after sharing. With just a click, easily share a link to files and folders in your cloud services. Share your link by email, IM, social media or the Clipboard. WinZip’s built-in email feature now supports IMAP for Gmail and Outlook (Hotmail). It also supports Gmail’s two-step authentication process. 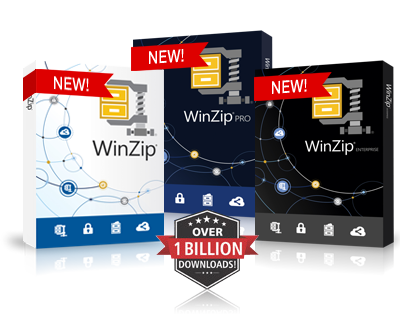 WinZip 22 lets you share directly to YouTube, Facebook, Twitter and LinkedIn. You can also securely share to many leading cloud services and several instant message services, including Twitter IM, Office 365 groups, Google Talk/Google+ Hangouts and Jabber. Quickly turn a photo or document into a share-ready image or PDF with the new WinZip Scan and Share feature. Start your scan right from WinZip. Then WinZip can zip it and save it locally, on the network or on a cloud service. Or share it by email, social media or instant message—encrypt if you wish to protect your scanned information when sharing. Easily share photos, documents, receipts and more. New support for flatbed scanners means you can scan multiple images into a single PDF without using a document feeder. Streamline photo sharing by quickly getting photos directly from your camera to share via WinZip. SmartShare makes sharing as easy as choosing a file and a destination. Select a file from your computer, cloud service or zip, then choose to share the file via social media, IM or email—and WinZip does the rest. Sharing by Skype messages and other apps is easy with automatic links available for pasting from the Clipboard. WinZip Pro users can share an image directly from the File Viewer to social media sites with just a click. WinZip connects directly to ZipShare, Box, OneDrive, Dropbox, Google Drive, CloudMe, SugarSync and MediaFire, so you can organize all your cloud files at once. Use WinZip to zip and save large files to the cloud or retrieve files or links to share. Secure your files and save precious online storage space by zipping and encrypting them first. Get direct access to the ZipShare file sharing service. This powerful web app makes sharing large files easy no matter where you are or what device you’re using. Access your ZipShare account directly from within WinZip 22. Connect to your cloud accounts and easily share compressed files via email. Zip and share any type of file along with a message to Facebook, Twitter and LinkedIn. Send files up to 500MB free using ZipShare or move up to ZipShare Pro to send up to 5GB. WinZip 22 lets you email large files or folders using any of your supported cloud services. Your files are automatically uploaded to your default cloud service and a link to them is placed in your outgoing email. Quickly and easily reduce image file size and convert images from one format to another, for example, from jpg to png. Add to a Zip file or save to your desktop for multi-use. WinZip Express enables you to share files in many ways, now including the clipboard! Easily place a cloud link for any file onto the clipboard where it may be pasted into other apps for sharing. You can now send a message via WinZip emailer to a one-time recipient and not add it to your contacts list. There is also a new option to never add recipients that are manually entered. This is particularly useful during a job search or any repetitive activity whereby a message is sent to a receiver you will likely never communicate with a second time. In the enterprise version of WinZip, buttons for disabled features will no longer be shown and therefore cannot be clicked on. No more confusion around what is and isn’t available, sparing needless cycles and erroneous admin tickets. Now Enterprise users largely interested in compression functionality may tap into the Classic interface, which hides the files and actions pane and displays only the ribbon. This can be facilitated upon initial set up and users may later change settings if they prefer to use features beyond compression. A new Move button alongside the Add button makes it clearer for you to either add or move files into a Zip file. Files Pane tabs let you open, view and manage different folders at the same time, instead of having to use multiple Windows Explorer windows. Conveniently see local, network and cloud-based folders, and just drag and drop files from one tab to another to copy them. The Folder Trees option of the Files Pane lets you see and navigate through your combined computer, network and cloud folder layout, making folder selection quick and easy. Now you can access a network location from another domain without leaving WinZip. Any network you have access to can be added to the WinZip Files Pane, even if it is not included in the list of available networks in Windows under the Network folder. Get all the information you need about an image, right in WinZip 22. Click the new Image Information button in the Preview Pane to view a dialog that includes height, width, pixels per inch, pixel depth/colors, file size and more. Quickly find and select the files you want to zip using the handy Places list, which shows files on your PC, network, computers in your Windows HomeGroup, and all supported clouds services. Save time by using the File Management ribbon to speed through many common tasks. Easily create new folders on your PC, network or cloud service. Securely delete files and folders. Copy, move, delete and multi-rename files, or easily restore them. Edit and update files, including those stored on cloud services. Map a folder or network location to a drive, copy a path or cloud link to the clipboard and much more. Quickly access your most-used file management features via the Manage File button. Regain space on your system and securely store or delete files with background tools that remind you about old files that can be zipped, deleted or moved to the cloud, unused files in Temp folders that can be removed and securely wiped, and files in the Recycle Bin that can be deleted, securely wiped or restored. See thumbnail previews of a selected file whether it is in your zip, on your computer or network or on any cloud service that provides thumbnail support. Click on the expand icon in the thumbnail to see a larger image in the new Preview Pane. Preview the contents of images and documents, rotate and resize images, save an image as your computer background, and share the previewed file by email, IM or social media. Scroll through files in the Previewer with the flick of a finger on touch displays. Convert Microsoft Office files to PDF and place them in a Zip file, or save the converted file locally or to the cloud. Easily share documents, spreadsheets and presentations with anyone. For extra protection, create a read-only PDF. Convert high-resolution images to more convenient sharing sizes instantly when adding them to your Zip. This lets you share entire albums with ease while keeping full-quality originals on file. Reduce and enlarge images, then save them locally or to the cloud. Add watermarks to your photos if you wish. Browse the contents of a Zip file before deciding if you need to save the contents. The advanced ‘Unzip and Try’ feature lets you temporarily review related components within a Zip file (such as an HTML page and its associated graphics). Easily change the WinZip interface to hide or show the features you need. WinZip 22 displays zipping features by default, but you can easily switch to the file management pane when you want to work with your files. WinZip configurable settings are now easier to find and adjust. Like the WinZip you know? Just click to use the familiar ribbon. Easily remove personal data (EXIF) from various files so that when they are shared, your information is not included. Secure any of the following file types to ensure they do not contain additional data that, while not typically visible, may be personal: DOC/DOCX, GIF, JPG (JPEG), PDF, PNG, PSD, PPT/PPTX, and XLS/XLSX. Enterprises can recover encrypted files left by past employees or during forensic audits, quickly and easily, to avoid significant downtime. You can now easily encrypt an existing Zip file with a click of a button on the Tools ribbon. The WinZip tools tab on the ribbon makes it simple to choose all or selected files in an existing open Zip file, and encrypt them in one step. This time-saving technique vastly eliminates room for error. When updating a Zip file which contains encrypted files, WinZip automatically applies encryption to the replacements. Prompting of the password for the original file protects against unauthorized access. Encrypted files within a Zip file cannot be deleted without knowing the password. This new default minimizes erroneous file deletion. Whether you’re converting to PDF, resizing photos, adding watermarks or encrypting, you can select or change settings before, during or after you have created your zip. Apply the changes to all the files in your zip or only to the individual files you’ve selected. Protect your files from unauthorized access by applying banking-level security with FIPS 197-certified 128- or 256-bit AES encryption. For extra security, set your own password policy by defining complexity requirements that WinZip will enforce for you. Deter unauthorized copying, add traceability and protect your intellectual property by adding custom watermarks to images and PDFs. You control the transparency of your watermark, and choose how and where it appears. Add a date/time stamp to your watermark for even more security. Enterprise users may now use the Job Wizard to back up personal files in a Windows Protected Environment (WIP), without having to manually suppress work files. For added security, you can now have WinZip shut down your computer for you after running an automatic backup. Drag and drop files from almost anywhere into the Job Wizard for backup. Combine files from your computer folders, the network and cloud services in one backup. Save the resulting zip to the cloud if you wish. Automate back up and distribution by creating a job that gathers files from various cloud services, zips them and distributes the zip via email according to your schedule. Enhanced automatic backup creation and editing lets you skip steps when defaults and settings do not need to be changed. Send notifications by email and instant messaging when automated jobs have completed using the Job Wizard. Auto-backup to any connected cloud account, desktop folder or between cloud accounts.